Blissett, Luther. “La jouissance du retour en enfance.” Beaux Arts Magazine December 2014, p. 48. Koons, Jeff and Norman Rosenthal. Jeff Koons: Conversations with Norman Rosenthal. Hove, England: Thames & Hudson, 2014, p. 77. Moderna Museet. Sculpture After Sculpture: Fritsch/Koons/Ray. Exh. cat., Ostfildern: Hatje Cantz, 2014 [Texts by Jack Bankowsky, Thomas E. Crow, Nicholas Cullinan, Made Great, conversation between Michael Fried, Isabelle Graw, Michelle Kuo, Charles Ray, Scott Rothkopf], p. 62. Polsinelli, Michael and Sasha Burkhanova. “The Words.” Garage Magazine Fall/Winter 2014, p. 89. Rothkopf, Scott, ed. Jeff Koons: A Retrospective. New York: The Whitney Museum of American Art, 2014, p. 39, 42, illustrated in color. Hans Ulrich Obrist. Jeff Koons: The Conversation Series. Germany: Verlag der Buchhandlung Walther Konig, 2009, [First draft] p. 61, illustrated in b&w. Serpentine Gallery. Jeff Koons: Popeye Series. Exh. cat., London, 2009, p. 70, illustrated in color. Neue National Galerie. Jeff Koons: Celebration. Exh. cat., Berlin, 2008, p. 45 and 106, illustrated in color. Gagosian Gallery. Hulk Elvis. Exh. cat., London, 2007, fig 40, p. 40, illustrated in color. Holzworth, Hans Werner, ed. Jeff Koons. Cologne, 2007, p. 14, 67, and 596 (installation view), illustrated in color. McElheny, Josiah. “Readymade Resistance: On Art and the Forms of Industrial Production.” Artforum October 2007, p. 329, illustrated in color. Walsh, Daniella. 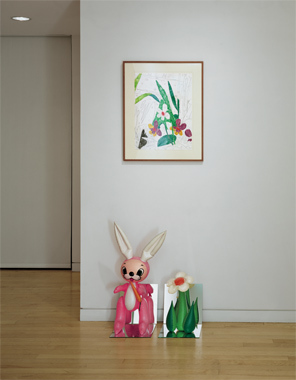 “Jeff Koons: On Track.” Art & Living (no. 7) Summer 2007, p. 44, illustrated in color. Kunstahus Bregenz. Re-Object: Marcel Duchamp, Damien Hirst, Jeff Koons, Gerhard Merz. Exh. cat., Bregenz, 2007, p. 123, illustrated in color. Canarutto, Sarah Cosulich. 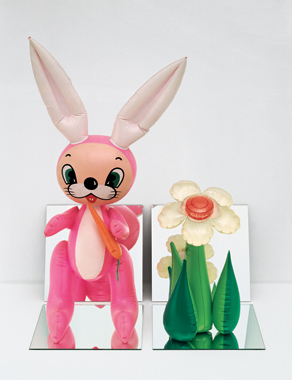 Jeff Koons (Supercontemporanea Series). Milan, 2006, p. 18-19, illustrated in color. Varnedoe, Kurt. Pictures of Nothing: Abstract Art Since Pollock. Princeton, 2006, p. 39, illustrated in color. Thomas, Kelly Devine. “The Selling of Jeff Koons.” Art News (104, no. 5) May 2005, p. 116, illustrated in color. Museo Archeologico Nazionale. Jeff Koons. Exh. cat., Naples, 2003, p. 25, illustrated in color. Kunsthaus Bregenz. Jeff Koons. Exh. cat., Bregenz, 2001, p. 12, illustrated in color. Deutsche Guggenheim. Jeff Koons: Easyfun-Ethereal. Exh. cat., Berlin, 2000, p. 28 and 72, illustrated in color. Seward, Keith. "Frankenstein in Paradise." Parkett (no. 50/51), 1997, p. 71, illustrated in color. Tayor, Brandon. The Art of Today. New York, 1997: 91, illustrated in color. Muthesius, Angelika, ed. Jeff Koons. Cologne, 1992, p. 88, illustrated in color.